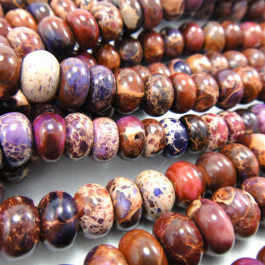 Purple Impression Jasper Gemstone 5x8mm Rondelle Beads (80pce Strand) - 40cm /16'" Strand. Impression Jasper is the accepted trade name for Variscite. Variscite was first described in 1837 and named for the type locality of Variscia, the ancient Latin name for Vogtland in Germany. Believed to be soothing and calming for body and mind giving emotional stability and self-confidence. Said to bring abundance.